Do Early Experiences Make a Difference to a Baby’s Brain? Do Early Experiences Matter when it comes to a Babys’ Brain? 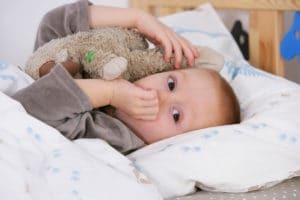 Research have shown that the first three years of your child’s life are uniquely important, because this is the most sensitive period for brain development. The experiences your child will have during this time, will shape the architecture of his/her brain, and build the connections that will help him/her develop important life-long skills like problem-solving, communication, self-control and relationship building. New brain connections are formed at a rate of 700 every second in response to your baby’s experiences out in the world. These connections help your baby learn the essentials to survive and thrive within his/her family, community and culture. It’s the quality of your baby’s relationships that has a major influence on which brain connections take place and the strength of these connections. What does this mean in Terms of a Baby’s Brain? Early experiences do matter. Your baby’s brain connections, reflect the quality of care he/she receives. These differences have impacts that can last a lifetime, because our brain connections affect the way we think, the way we learn, and the way we manage our feelings and build relationships with others, all the way into adulthood. 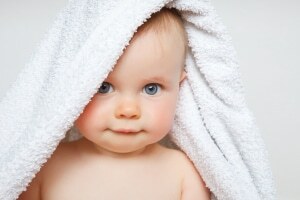 What can you do to optimise your baby’s brain development? Tune in to your baby’s signals, words, facial expressions and actions. Respond in a way that respects your baby’s needs. When you respond in a sensitive way, you are letting your child know you understand what he/she is telling you – that you respect his/her needs. These loving back and forth interactions build strong, positive brain connections that help your child thrive over time. Like a game of catch, it is all about back and forth. One of you starts the interaction – the other responds. Talk to your baby – and give them time to respond, through sounds, words or actions – then you answer back. It’s a dialogue. There is another, perhaps surprising experience, that also nurtures healthy brain development…. That’s right! A little bit of stress goes a long way towards building a strong, healthy brain. Helpful stress is brought along by the everyday challenges we face, like muscling through a difficult task or experience. These challenges help us learn new skills and how to solve problems, such as figuring out a puzzle or dealing with some difficult feelings. Working through this kind of stress is what helps us to get along with others and ultimately succeed in work, school and life. Your child is able to tolerate stress, because you are there to support him/her and he/she has learned to depend on you. So watch your child carefully to see what he/she is capable of and when he/she needs your help. Giving your child a chance to struggle a little, helps him/her how to solve problems on his/her own. See yourself as a coach, offering ideas or suggestions, but do not take over. Step in only when it is necessary. Remember, it is mastering new challenges that builds brain power and the motivation to learn. So what matters the most? YOU!!! Remember…You are not just singing lullabies, stacking blocks, changing diapers, playing peek-a-boo or sharing stories. You are helping your baby build a healthy brain! 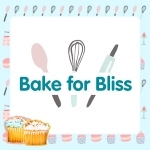 https://www.mybump2baby.com/wp-content/uploads/2019/04/Do-Early-Experiences-Make-a-Difference-to-a-Babies-Brain-2.jpg 642 960 Carla Lett https://www.mybump2baby.com/wp-content/uploads/2018/08/My-Bump-2-Baby-Logo-1.jpg Carla Lett2019-04-09 21:23:262019-04-10 14:30:43Do Early Experiences Make a Difference to a Baby's Brain? 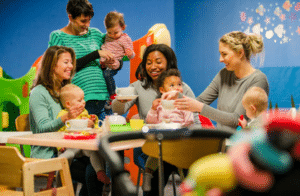 We are very lucky in this day and age to have so many amazing baby and toddler groups in our local area. We love the experts sharing the many benefits of their fantastic classes. 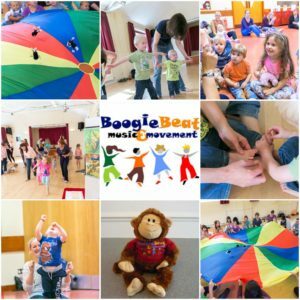 Today, Rachael Hickson the owner of the wonderful Boogie Beat Music and Movement Preston, Blackpool & Fylde, Shares the Benefits of Music and Movement. Music and Movement is a fantastic way of encouraging the social and emotional development of both babies and children. Our Boogie Beat workshops and classes deliver a variety of engaging and stimulating learning opportunities through the use of Music and Movement. Music and Movement allows both babies and children to explore the movement of their bodies in a safe and creative environment. At Boogie Beat we combine traditional fairy tales and nursery rhymes alongside beautiful dance and movement themes to help tell traditional stories whilst using all our own composed music and illustrations. All of this allows imaginations to come to life. Our workshops and classes allow the children and babies to be lively, energetic and grow in confidence as they dance and sing. 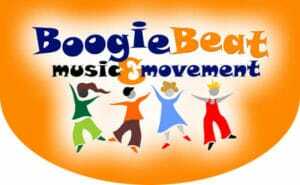 Boogie Beat uses toy box songs, we experiment with instruments, scarves and beanbags and use delightful classical music to inspire all senses, allowing all ages from babies up to school age to enjoy our structured lesson plans. Our workshops and classes are educational and cover all seven aspects of the Early Years Foundation Stage Curriculum. 🧡 Communication and language development involves giving children opportunities to experience a rich language environment; to develop their confidence and skills in expressing themselves; and to speak and listen in a range of situations. 💙 Physical development involves providing opportunities for young children to be active and interactive; and to develop their co-ordination, control, and movement. 🧡 Personal, social and emotional development involves helping children to develop a positive sense of themselves, and others; to form positive relationships and develop respect for others; to develop social skills and learn how to manage their feelings; to understand appropriate behaviour in groups; and to have confidence in their own abilities. 💙 Literacy development involves giving children access to a wide range of stories, songs and rhymes; to ignite their interest. 🧡 Mathematics involves providing children with opportunities to develop and improve their skills in counting, understanding and using numbers. 💙 Understanding the world involves guiding children to make sense of their physical world and their community through opportunities to explore, observe and find out about people, places, technology and the environment. 🧡 Expressive arts and design involves providing opportunities and encouragement for sharing their thoughts, ideas and feelings through a variety of music, movement, dance and role-play. We can use Music and Movement to support children and babies with special educational needs which is something that we take great pride in – both baby and child develop their communicational, sensory and physical needs, but most importantly have fun!! 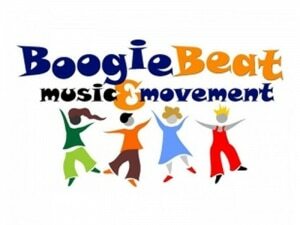 Our Boogie Beat Music and Movement workshops run within Nurseries and Primary Schools covering Reception, Year 1, Year 2 and After School Clubs– bringing new creative and imaginative ideas into schools and nurseries to enthuse both children and Teachers/Nursery Nurses. 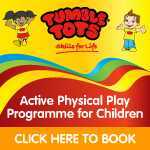 The children can experience the variety of carefully planned activities tailored to their setting. We use music and movement to develop teamwork and the activities are great physical exercise for the children, allowing their confidence, expression and creative ideas to develop. Language and communication skills are strengthened as the children take part in this. Introducing your baby to music and songs is an easy and enjoyable way to interact with your baby in his first year and can help set the stage for lifelong musical development. Plus, playing together with music can brighten their mood, benefit their brain, and boost their language skills. Dance helps your baby to develop a good sense of rhythm, form, time and flow. 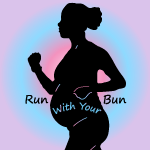 Your babe-in-arms will internalise the rhythmic movements and continue developing the understanding of a steady beat, the underlying, unchanging, repeating steady pulse he would have heard during pregnancy. When dancing while holding your baby, you are replicating vestibular stimulation he would have experienced in utero – the rocking and swaying. 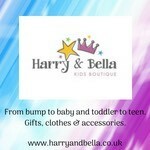 This helps to calm your baby, helps him feel secure and provides many lovely parent/baby bonding opportunities. Dance allows for imitation, repetition, coordination and exploration of movement to the rhythm, mood and feeling of music. Dances and songs provide opportunities for memory training and coordination, even at this early stage. Why on Earth Would You Want a Birth Photographer?? Why on earth would you want a birth photographer? This is a question ALL of my expectant couples get asked, at least once, when discussing their birth plans with friends and family. Well, this comparison may just answer that popular question. The image on the left is me and our daughter Millie straight after she was born. My husband, in his panic to get the perfect image that I had barked at him to take, grabbed his iPhone and took this photo. 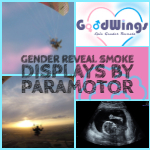 As much as I love it because it’s the first image of our daughter I secretly loathe it because of several reasons. Millie is barely in the image, you can’t see her face, he’s got the phone right in my face, the lighting is shocking, and I look terrible but most importantly, it’s not in focus. 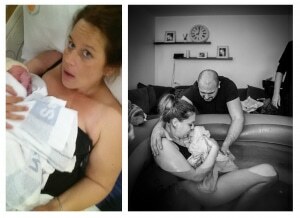 The image on the right is from a home birth a professional birth photographer took, me. Both images are raw and un-posed, caught in the throws of the ‘we did it moment’. This intimate moment is captured from the other side of the room! The sun was just rising and there were no lights or lamps on in the room. The only light was from a window behind me. However, you can still clearly see every emotion and feature, even the time of birth on the clock, placed strategically by me, is frozen in time. All these things come together in the images I captured because I’m trained, experienced, have the right equipment, but importantly, I’m a mum who understands how intimate a time this is. Building a relationship of trust and respect with the health professionals and not getting in their space is another important key to everyone feeling comfortable, relaxed and secure. My couples place their trust in me to get the best images I can whilst still respecting their privacy as they bring their child into the world. As with their births, the parents are in control. I only capture images that my clients want me to capture. With my experience I can make sure my images are as discreet as I am when taking them. I know how to frame a shot without having it posed, but most importantly I take images that protect intimate angles, if this is what has been requested. 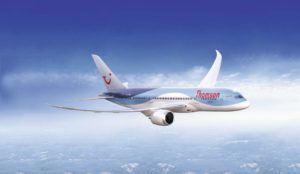 This, as well as other details, are discussed at length in a consultation before the 38th week. We need to know our expectations and outcomes are the same. 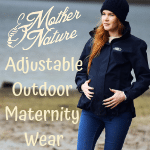 https://www.mybump2baby.com/wp-content/uploads/2019/02/claire-saye-10-1.jpg 2026 2786 Carla Lett https://www.mybump2baby.com/wp-content/uploads/2018/08/My-Bump-2-Baby-Logo-1.jpg Carla Lett2019-02-18 21:05:412019-02-27 14:24:03Why on Earth Would You Want a Birth Photographer?? Image Casting create beautiful casts in a variety of materials from cold cast metals, to real metals (hot founded metals) and glass and we are often asked to explain how the metal casts differ. Traditional bronze and sterling silver casts – hot metal casts – are made in a foundry using the “lost wax” method which is a complex, time and labour intensive process. It requires an artisan with years of experience to create a good quality cast, with skill and judgement being exercised at every step of the process. This is especially true in achieving the precise temperature of 1200 degrees for the molten bronze! If you are interested in the full process and the complexities of hot metal casting Wikipedia provides a good general overview of the process – Click here to read it. 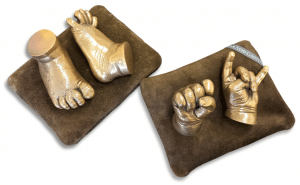 Hot metal casting (lost wax method) is a diminishing craft and this, combined with the increasing costs of raw materials, has resulted in a significant rise in the price of real bronze baby hand and foot casts. What is “Cold Cast” Bronze? Cold cast bronze is also known as bronze resin or bonded bronze and, as the name suggests, does not require any heating which makes it more accessible. The initial process of creating a mould is the same as for hot metal casts but after that the process is quite different. Unlike hot metal casting, the entire cold cast process is completed in-house. A two-part epoxy resin forms the basis of the cast. The two liquids are combined and at Image Casting we mix in real metal powder which is poured into a silicone mould and then left to cure to create the cold cast. 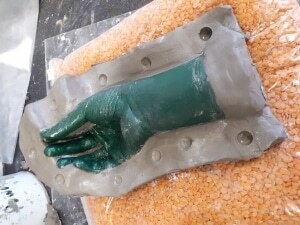 By mixing the metal powder throughout the cast it creates weight and ensures there is an even colour across the surface. The cast is then very carefully polished and finished to bring out the shine and beauty of the metal and the fine detail of the cast. If comparing directly to real hot cast bronze, the cold cast finish is like a mid-patination, so a warm mid brown rather than the traditional dark patina that is often associated with real bronze. The casts can be difficult to tell apart by look alone but if a cast is warm to the touch or can be scratched with a key or coin, it is more likely to be resin than real bronze. With our bronze cold casts, we pack plenty of bronze metal powder into the resin so there is a good weight to the cast. Some companies choose to cast a shell of bronze resin, which is just a thin layer that coats the mould, and then use a light mineral-based filler to fill the rest of the mould. Others may use acrylic paints applied directly onto the surface of a plain resin or plaster cast which flattens the surface in comparison and makes for a much lighter weight and doesn’t look or feel like real metal. As you can tell, the process is considerably faster and less expensive than that required for hot metal bronze and another advantage of cold casts over real metal is that they can be framed as well as freestanding. What can be cast in cold metal? If a mould of an object can be made, then a cold metal cast can be created! For more delicate objects the mould may need to be made in 3 or 4 sections so that nothing gets damaged in the original object and this requires great skill to ensure that the joins are not visible in the finished cold cast. What have Image Casting made in Cold Metal? A child’s plasticine model of her Dad! 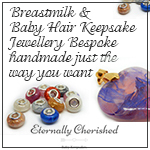 Whether it is casts of your baby’s hands and feet or another unique keepsake that you would like to create, we are always happy to talk through your ideas!! Summer and swimming go together like jelly and ice-cream. But when days are short and dark, swimming is the perfect winter activity for families. Water Babies explains how it lifts spirits, improves sleep and boosts immunity. Nothing beats fresh air. Bundling up and getting out is a great antidote to stuffy central heating and feeling stuck indoors. But for the littlest members of the family in their pushchair or sling, it’s often too cold and wet to get out and get moving. That’s where swimming comes into its own. 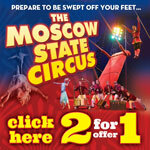 A fantastic whole body activity, it’s something that all the family can do together whatever the weather. And supported by warm water, it gives even the smallest babies the opportunity to move, learn and play. 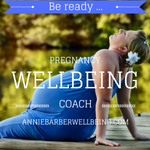 Exercise is wonderful for your baby’s wellbeing, health, sleep, feeding and immunity. It’s also vital for their physical and cognitive development. In fact, movement plays a key role in the way babies grow, learn and develop. Research shows us that physical play and activity drops in winter months. Yet NHS guidelines say that babies should be as active as possible, while toddlers should get three hours of activity a day. While exercise helps with the obvious stuff like muscle strength endurance and motor skills, it also builds your little one’s developing self-esteem and thinking skills. Active children tend to have a more positive outlook on life and sleep better. There is also evidence that even a moderate amount of exercise boosts immunity. When you’re both wearing layers of clothing all the time, opportunities for precious skin-on-skin bonding are few. But swimming together in a warm pool is wonderful for skin-on-skin, plus the fun, sociable side of swimming is fantastic for everyone’s moods. And, of course, all this exercise, bonding with your baby, social time with other parents who soon become friends not only helps physically and developmentally, it also helps beat winter blues, postnatal blues, depression and anxiety. So, a regular swim with your baby packs in more benefits for you both than you thought possible! It’s good for your physical and emotional health, and it’s instrumental in keeping your baby happy, healthy and growing well. Water Babies lessons come in 10-week-long chapters with the same teacher and group in the same warm, private pool. They’re based on fun, play and bonding that get your baby moving in way that they can’t on land. There’s something magical about being with your baby in water. 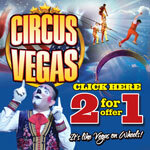 As they relax, uncurl, splash, kick and smile, you discover a wonderful, bonding experience that you can enjoy together. 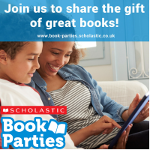 We teach across Bristol, Bath and North Somerset. Call 0117 946 6919 to book your place or register at www.waterbabies.co.uk/contact/bristol-bath-and-north-somerset. Strong to the core – At what age can a child swim properly? At what age can a child swim properly? It’s a question we get asked a lot at Water Babies, and it’s all down to water confidence and core strength. Firstly, it rather depends on what you mean by ‘swim properly’. Thanks to innate reflexes, babies can swim under the water from birth. But to be able to swim on the surface, lifting their head to take a breath, little ones need a degree of strength that comes with age. As with everything, that age varies from one child to the next. But toddlers from the age of around two-and-a-half years start to be able to swim front paddle on the surface and breathe as they go. The strength that a toddler needs to lift their head while swimming comes from the core. If you’ve done exercise yourself, you may know a bit about core strength. This is a deeper layer of muscles around your abdomen, back and pelvis that supports your body to sit, stand and move and do many other physical activities. Like any muscle, you can strengthen your core through exercise. And guess what? Swimming is one of those fantastic core strengthening activities. Because you’re supported in the water, you can move your body in ways that you can’t on land. And this is especially true for babies. In fact, Water Babies’ research has shown that babies who swim from birth are ahead of the curve in reaching physical milestones like sitting and walking. That’s because they swim from babyhood, practising core-strengthening activities in their lessons. But having good core strength is all very well if your toddler won’t put their face in the water. Making sure your child is confident under water is a big deal when it comes to swimming and also water safety. 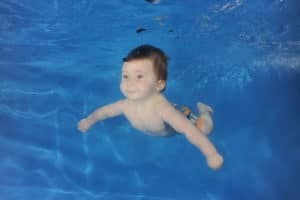 Swimming regularly from a young age, dipping under the water in a fun, gentle, controlled way means that babies and children will not only love the water, they’ll also be calm and comfortable no matter what. One of the very first things we teach at Water Babies is how to prompt babies’ natural reflex to hold their breath. And as they grow up, we teach them how to control their breath. That means that when they are strong enough to swim their first width, they can gently exhale under water and then lift their heads to breathe. And that first swim across the pool is pure magic! It’s often that moment when parents tell us ‘this is what it’s all about it’. Because there’s nothing that makes you – and your toddler – prouder than learning to swim together. By the age of 2 ½ to 3 ½ years old, most Water Babies can swim short distances on their own, taking a breath as they go. Swimming since babyhood, they’re confident, able to control their breath and they have developed that wonderful, strong core. Water Babies has been teaching babies, toddlers and pre-schoolers to swim in Bristol, Bath and North Somerset for the last fifteen years. Our lessons are progressive, positive and fun. 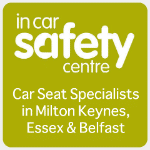 Get in touch to find a class that suits your family. 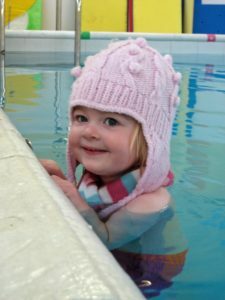 Call 0117 946 6919 look at our website www.waterbabies.co.uk or email underwater@waterbabies.co.uk. https://www.mybump2baby.com/wp-content/uploads/2018/10/At-what-age-can-a-child-swim-properly.jpg 4032 6048 Carla Lett https://www.mybump2baby.com/wp-content/uploads/2018/08/My-Bump-2-Baby-Logo-1.jpg Carla Lett2018-10-17 21:06:222018-10-17 21:09:00Strong to the core - At what age can a child swim properly? 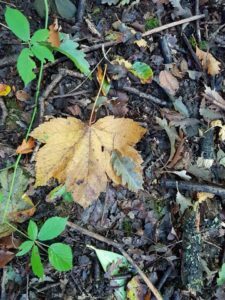 I used to love the Autumn clock-change – a whole extra hour in bed without having to sacrifice anything else in return…bliss! Like many parents, I am now accustomed to rising with my little lark and whilst 7am certainly isn’t inhumane, the prospect of a 6am wake up on Sunday 28 October appeals rather less! However, some little ones routinely rise at 6am – cue the parental fear that the clock-change will, literally overnight, turn that 6 into a 5! As a little one won’t have made it all the way to 8pm with this approach, parents should expect him to wake a little early by the new clock time on the Sunday morning. However, this will iron itself out pretty quickly over the course of the following few days. 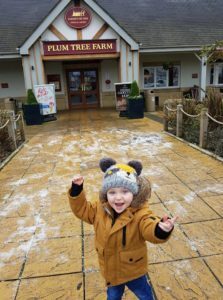 For some little ones, it can take up to a week before things feel fully settled onto the new timings but they will adapt. Little Sleep Stars creates gentle, bespoke sleep plans to enable babies and children up to 6 years to reach their sleep potential. The business is owned by Lauren Peacock, a former tired mummy who was never prepared to leave her own little boy to cry. Through a detailed assessment and consultation process, Lauren is able to identify what is causing an individual child to struggle to sleep well. No two children are the same and nor are any two sleep plans but with right, tailored and gentle plan in place, any child can learn to sleep well. 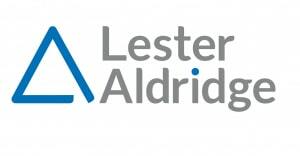 All consultations are carried out using web-based video-conferencing, enabling Lauren to work with clients throughout the UK and even overseas. 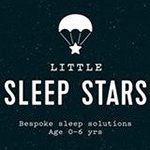 Little Sleep Stars offers a free, no obligation, 15 minute call to any family needing support with their child’s sleep so to take the first step on the path to better rest for your whole family get in touch today.